Visual Studio Code>Other>TODO ListNew to Visual Studio Code? Get it now. 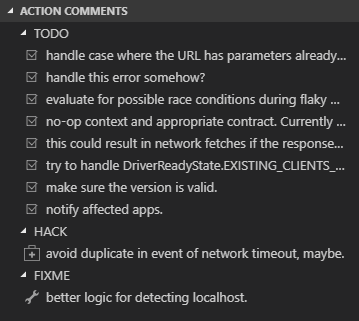 This VSCode extension will list all of your TODO-type comments in an easy-to-read tree view panel. Press Ctrl + Shift + T to insert a comment in current cursor position. Right-Click a comment in Action Comments list -> Create Trello Card. On first use, you'll have to supply a token. If you don't have a token, just press Esc and follow the notification instructions. 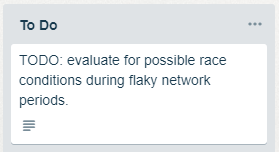 Next, you'll need to select a Trello list to create cards in. That's it. The card is created in the list you selected on first use. TODO – something to be done. FIXME – should be corrected. BUG – a known bug that should be corrected. UNDONE – a reversal or "roll back" of previous code. RegExp to use for extracting comments (first group must be type, last must be text). We recommend capturing only all-uppercase types to avoid capturing tslint: and commented properties. Scan comments when saving a file. Glob pattern to exclude from scans. Name to use as Created by. 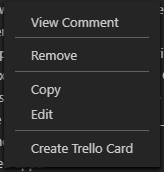 In order to create Trello cards, this extension requires read and write permissions. Click here to generate token.